I perused the interwebs to find a good pound cake recipe, and I landed upon this particular recipe. Cream cheese pound cakes tend to be very dense and moist and they last for a good while without going stale. That, plus they’re DELICIOUS. I took this to my Sunday School class for breakfast this past week, and everyone loved it. I got lots of compliments on how moist it is. 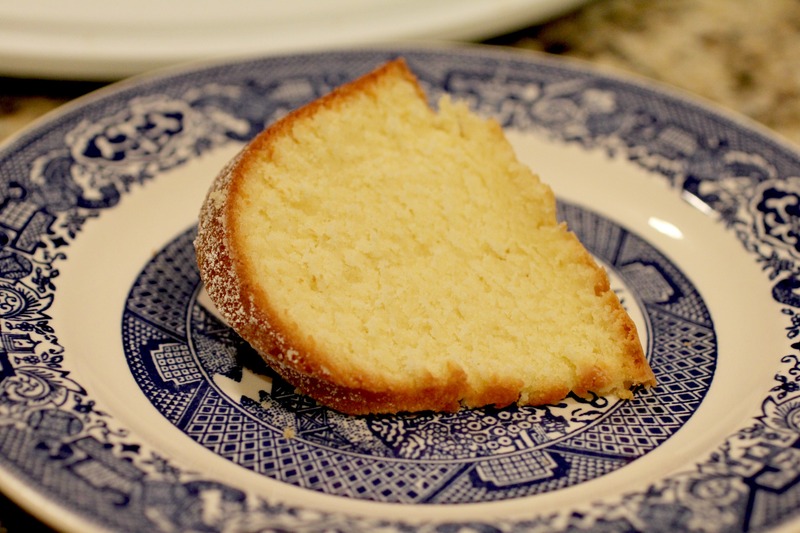 Don’t you just love how pound cake is an acceptable breakfast item? I do. 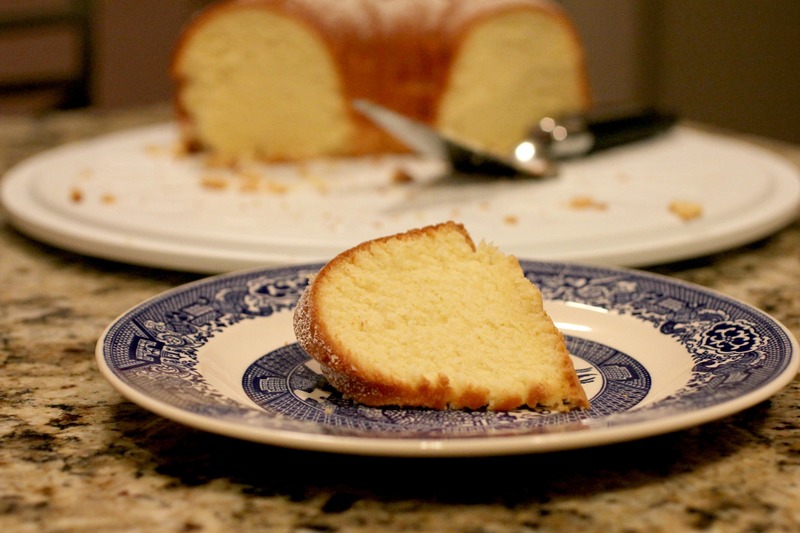 This is a great, basic recipe for a pound cake, and I loved it. Next time, I might try to get creative and add a glaze or maybe some lemon zest to give it a new twist. I did find myself wishing for some fresh fruit to accompany this yummy cake! Preheat oven to 325 degrees F. Grease and flour a 10 inch tube pan or 10 inch bundt pan. In a large bowl, beat butter and cream cheese until smooth. Add sugar gradually and beat until fluffy. Add eggs one at a time, beating well with each addition. Add the flour all at once and mix in. Add vanilla and mix. Pour into prepared pan. Bake for 1 hour and 20 minutes. A toothpick inserted into center of cake should come out clean. Garnish with powdered sugar, if desired. That looks delicious Lindsay, I adore pound cakes! Reblogged this on teamjas's Blog. Reblogged this on Bistro Sel. Should I add baking powder or baking soda to this recipe? No need, Kathleen. The ingredients listed result in a perfectly moist cake! If you’d like to add something to the recipe, please let us know how it turns out! Can you use a loaf pan instead? It would definitely still turn out well, but loaf pans are smaller than bundt pans, so it might take more than one. This recipe filled my 12 cup bundt pan, so make sure your pans will hold 12 cups, and you’ll be good! I am going to try this today with my Mississippi Roast !!! Can hardly wait !! Will let you know the outcome !!! Thanks, I hope you liked it! Linda, I’ve never frozen this particular cake so I can’t say with certainty if it would work. However, I think most cakes can successfully be frozen and thawed so I doubt this would be a problem. Want to try to recipe but in the directions it calls for 3 sticks butter, now with the butter is it non salted, or salted butter? I don’t know if it really matters, as I truly think either one will turn out excellent! However, for baking recipes usually call for unsalted butter. Thanks so much Lynne! I appreciate this excellent feedback! Sounds like you’re quite the hostess, even for unexpected visitors! Bake that often so I. Don’t see a reason to by 1. The bundt pan holds 12 cups. The 8×8 pan only holds 8 cups so that wouldn’t work. It would fit in a 9×13 which holds 15 cups, but you would need to shorten the baking time. I would start checking it at like 45 minutes, and if it’s not done just keep checking every 5 minutes or so. Hope that helps! I’ve been making this exact recipe for 40 years, and it never fails to produce a beautiful moist poundcake. Sometimes I add chopped walnuts (my husband’s favorite) and we love that as well. Thanks for commenting Patty! A recipe that’s been used for 40 years is guaranteed to be good. You have one lucky husband! could I add cocoa to this recipe for a chocolate pound cake- or would that require other ingredients? Hmmmm, I’ve never thought about that! I think it would be pretty much the same just with the cocoa added. Though I have no idea how much you would need to add to make it chocolatey. I did a quick search and found this recipe that is very similar but for a chocolate cake: http://www.food.com/recipe/chocolate-cream-cheese-pound-cake-336374. Hope that helps! I look forward to trying this recipe – sounds so delicious. It’s truly nostalgic to hear you say you eat it for breakfast as my grandmother loved to eat pound cake for breakfast! She would even toast it sometimes. Thanks for the memories. I bet it would be great with a smear of Nutella! Thank you Janet! I hope you love it. And yes, Nutella does sound like an excellent way to top off this yummy cake! Can you use Splenda instead of sugar? I’ve never tried substituting it, so I’m not sure if it would have any adverse affect on the cake. But I would think it’d be totally fine! While copying down this recipe, had this idea. to pound cake btter, add some melted white chocolate squares & one or two teaspoons of Watkins chocolate flavored extract instead of vanilla extract. Might make a wonderful White Chocolate Cream Cheese Pound Cake with a very chocolately taste. Watkins chocolate flavor extract can be purchased from any local Watkins seller or ordered online from the Watkins website. Meant say pound cake batter, not btter. Sorry for spelling error. Wow Carolyn, I never would’ve thought of that! Thanks for the great idea! Looks delicious and very moist will try on the weekend, everyone loves a pound cake. Thank you. Hi. Is it possible to use wheat flour instead of all purpose flour? Can i ask more recipes using wheat flour? I had plenty of wheat flour and i dont want to be put it in waste. Thanks so much. Hi Anonymous. Unfortunately, I know very little about the various types of baking flours and their uses. I recommend checking out Joy the Baker’s tutorial at http://joythebaker.com/2014/05/baking-101-the-difference-between-baking-flours/. Here’s an excerpt regarding your question: “How do you substitute Whole Wheat Flour for All-Purpose Flour? Start by substituting 25% of the all-purpose flour for whole wheat flour. You can work you way up to substituting up to 50% of the all-purpose flour for whole wheat flour. Beyond 50%, we’ have to make adjustments in terms of liquid, as whole wheat flour is more absorbent than all-purpose flour. The easiest way to add the goodness of whole wheat flour to your all-purpose flour recipes is to use White Whole Wheat Flour.” Hope that helps! Made this recipe for my very picky eaters and it was a hit! I had to stop my kids from eating too much and my husband couldn’t stop complimenting the moistness. Great recipe! Thank you Dee! 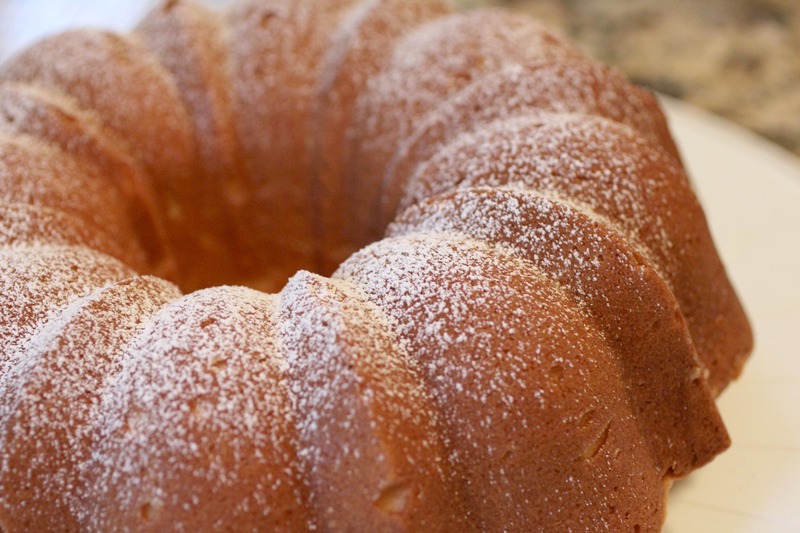 Ya just can’t beat a classic pound cake!